The Mind Molester | OhGizmo! I’m feeling evil, just for the heck of it. Not Jeffrey Dahmer cannibal-soup evil, more like Janet Reno striptease evil. You too can join in the fun with the Mind Molester, from ThinkGeek. 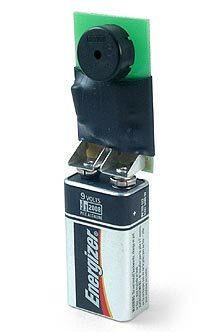 You simply plug a 9-volt battery into the device and plant it in an appropriate location. It produces a one-second electronic chirp about once every 3 minutes. Due to the chirp’s duration, frequency, and sound characteristics, it’s a very difficult, time-consuming, frustrating and maddening task to locate the unit. In a cubicle farm, you’ll likely be popping an aneurysm from suppressed laughter. All this fun for $25. Sort of a lot for something that will likely be stomped to death if found. Check it out here. Story VIA Random Good Stuff. Blogging gold, David. Blogging gold. That may very well be the funniest line i’ve seen in quite a while. Keep it up. Lol… glad you like, it. …or get one of those crappy little motion sensor alarms and let the battery run down. My father has one around the house and it drives me nuts. Same for pagers. My pager battery went low during the weekend, when I wasn’t carrying it. Drove me crazy trying to figure out where the beeps were coming from. I’ve seen pagers on ebay for about $3. The beep comes less often, which makes it harder to find. Your victim would rather see Janet Reno naked.